The La Mina trail starts at the Palo Colorado Information Center located at PR 191, km 12.2. If you are driving a car, you can park at one of two parking lots near the information center. The La Mina trail is about a mile long, descending from 2,132 feet to 1,640 feet. The full hike will take you approximately 1.5 hours total and can be challenging in difficulty. Some portions of the trail have concrete stairs and the path winds back and forth in some areas. There are shelters along the way that can be used for picnics or hiding from the rain and grills for barbecuing . 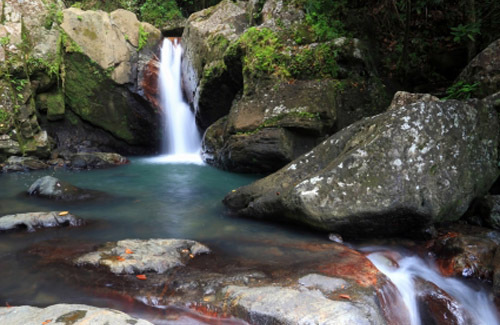 The La Mina trail is probably the trail most used in El Yunque. It's most popular feature is the relatively short distance to the pay off....the water fall!